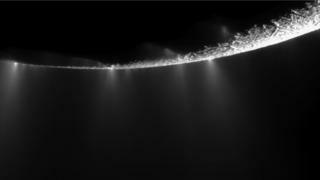 Image caption Easy to sample: Jets of water spew from the south pole of Enceladus. The assessment comes on the heels of new observations at the 500km-wide world made by the Cassini probe. It has flown through and sampled the waters from a subsurface ocean that are being jetted into space. Cassini’s chemistry analysis strongly suggests the Enceladean seafloor has hot fluid vents - places that on Earth are known to teem with life. To be clear: the existence of such hydrothermal systems is not a guarantee that organisms are present on the little moon; its environment may still be sterile. But the new results make a compelling case to return to this world with more sophisticated instrumentation - technologies that can re-sample the ejected water for clear evidence that biology is also at play. "We're pretty darn sure that the internal ocean of Enceladus is habitable and we need to go back and investigate it further," said Cassini scientist Dr Hunter Waite from the Southwest Research Institute in San Antonio, Texas. "If there is no life there, why not? And if there is, all the better. But you certainly want to ask the question because it's almost as equally as interesting if there is no life there, given the conditions," he told BBC News. Enceladus: A second genesis of life? The sub-surface ocean on Enceladus is thought to be many kilometres deep, kept liquid by the heat generated from the constant gravitational squeezing the moon receives from the mighty Saturn. Cassini has already established that this voluminous liquid is in contact with the rock bed from the types of salts and silica that have also been detected in the jets. But what scientists really wanted to know is if a particular interactive process seen at Earth was taking place in the distant abyss - something called serpentinisation. At the mid-ocean ridges on our planet, seawater is drawn through, and reacts with, hot upwelling rocks that are rich in iron and magnesium. As the minerals in these rocks incorporate H2O molecules into their crystal structure, they release hydrogen - a byproduct that can be used by some microbes as an energy source to drive their metabolism. It is the definitive signal for molecular hydrogen in the plumes of Enceladus that Cassini has now confirmed. "If you were a micro-organism, hydrogen would be like candy - it's your favourite food," explained Dr Chris McKay, an astrobiologist with the US space agency (Nasa). "It's very good energetically; it can support micro-organisms in grand style. Finding hydrogen is certainly a big plus; icing on the cake for the habitability argument, and a very tasty one at that." The type of microbes described by Dr McKay are called methanogens because they make methane as they react the hydrogen with carbon dioxide. Nasa, which leads the Cassini mission, was due to make the hydrogen announcement a couple of months after the probe's last fly-through of the moon's jets in October 2015. But the agency held off. One of the concerns was that the Ion and Neutral Mass Spectrometer on the satellite can actually make molecular hydrogen inside itself if water enters the instrument in a particular way. Dr Waite's group has spent a year analysing the data to make sure the hydrogen signal is intrinsic to the jets and not merely some artefact of the INMS's operation. And although serpentinisation is arguably the best explanation for the signal, it is possible to produce the gas also from the heating of very primitive (meteoritic) rock. The Cassini mission is coming to a close. Having spent 12 years circling Saturn, it is now running low on fuel and will be dumped in the atmosphere of the ringed planet in September - to ensure it cannot collide with Enceladus at some future date and contaminate it. As brilliant as the probe's instruments are, they were never designed to make a direct life detection at the bright white moon. This would need a whole new class of spectrometers. A proposal is being put together to fly them in 2026. Nasa has already green-lit a mission to Europa, an ocean moon of Jupiter. It very likely has serpentinisation going on as well. But its ice shell is very much thicker and it could be that very little of the water escapes to space. The appeal of Enceladus is the ease with which its subsurface can be studied because of the material carried into space by its network of geysers. A probe only needs fly through the emission to make the investigation. "The Cassini mission has really brought Enceladus to the fore in terms of the search for life elsewhere in the Solar System," commented British Cassini scientist Dr Andrew Coates. “The top three now I would say are about equal. There's Mars, which may have had life 3.8 billion years ago when conditions were very different to what they are now. There's Europa, which has a subsurface ocean; and now Enceladus. Those three may have, or had, the right conditions for life." Dr Waite added: “For life, you need liquid water, organics, and the CHNOPS elements (carbon, hydrogen, nitrogen, oxygen, phosphorus, sulphur). OK, we haven't yet measured phosphorus and sulphur at Enceladus. But you also need some kind of metabolic energy source, and the new Cassini results are an important contribution in that regard." A paper describing the work of Dr Waite's group is published in the journal Science. Enceladus: Does this moon hold a second genesis of life?